Use the following tips to help you get started and keep you going. Choose an exercise you enjoy. It’s easier to stick with a program if you enjoy it. Enjoy the outdoors? Start walking in parks around your neighborhood. Like to dance? Register for a ballroom dance class that gets you moving several times a week. Even if you can’t imagine yourself enjoying the exercise itself, do the exercise that has other rewarding attributes. For example, work out with friends so you can enjoy the social aspects of exercise. Start slow. The U.S. Surgeon General’s Report recommends at least 30 minutes of moderate intensity activity on most (5 or more) days of the week. 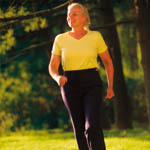 Moderate intensity is the intensity of a brisk walk. Your heart rate is elevated and you’re breathing faster than usual, but you’re not working so hard that you get worn out after a few minutes. When doing moderate intensity exercise you should be able to talk, but not sing. If you’re just starting an exercise program, don’t begin by exercising for 30 minutes all at once. Start with shorter exercise sessions and work up to longer sessions gradually. You start with sessions as brief as 5 minutes. As you get stronger and develop the exercise habit, 5 minutes can easily become 10 minutes, then 15, and so on. Set short term, specific, and realistic goals. Remember that it takes many steps to get to the top of the mountain, and everybody has to do it one step at a time. Set realistic short term goals for yourself, like exercising for 15 minutes on Monday, Wednesday, Friday, and Saturday this week. You can use these short term goals to build up to longer term goals. Monitor your activity. Many people find that it helps them to monitor their progress in writing. This can be as simple as keeping track of the days you exercise on a calendar posted on your refrigerator, or creating a graph of the amount of time you exercise each week so you can view your progress. Don’t forget to reward yourself! But lay off that ice cream as your reward. As we listed exercise has numerous benefits, but many of them are longer term so they don’t reinforce behavior change right away. Identify some rewards you can give yourself when you accomplish your goals. It’s probably easy to think of things to buy yourself for rewards – you could put off buying that new CD, book, or new exercise clothes until you achieve your exercise goal. But your rewards don’t have to cost money. For example, you could reward yourself by taking time to call a friend you haven’t talked to in awhile, or setting aside time to do an activity that you enjoy. Don’t give up if you miss one or two session. Starting an exercise program, or increasing the amount of exercise you do, is an important step in developing a healthier lifestyle. However, making a lasting change in your life isn’t easy. Some weeks you will make your goals; others you might fall short. It is important to be persistent; if you don’t make your exercise goal, don’t see that as a sign that you are not an "exerciser." Examine your goals to make sure they are realistic, then make a plan for the next week. Whether you want to do a 5-minute walk or a fifty-minute walk, one of the most important habits you can acquire is planning when this walk will occur. The more intense an exercise, the shorter amount of time you need to exercise to get the same benefits. Similarly, you can do a lower intensity exercise for a longer amount of time to get the same benefits. The table below lists some common exercises, their intensity level, and how many minutes per week you would need to engage in that activity for good health. If an activity is not listed, the average amount of time to spend on a moderate intensity activity is 150 minutes per week.